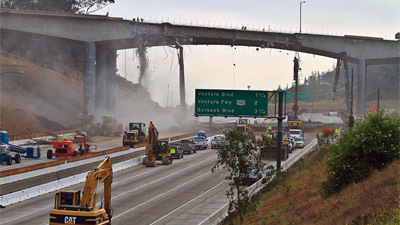 Carmageddon 405 Update… What Carmageddon? Carmageddon scares have been all over the news for the past three months no matter where you live. Today is day 1 and its smooth sailing everywhere in Los Angeles. It’s unbelievable! The creator of the catch phrase “Carmageddon”, County Supervisor Zev Yaroslavsky, is being credited with how smoothly the freeway driving is going. The theory is that if Los Angeles merely promoted this weekend as a standard 405 freeway closure, people would not have heed the warnings. But the name “Carmageddon” is scary enough that it made everyone pay attention and proactively plan to stay local. Genius! News crews set up races this morning to see how Jet Blue’s $4 promotional flights from Burbank to Long Beach Airport compete against car driving across the same distance; 28.8 miles. Who won you ask? Car driving dominated Jet Blue! A CNN car went from Burbank Airport to Long Beach Airport in 51 minutes while the airplane took 1 hour and 45 minutes. That includes gate to gate time of 45 minutes and 1 hour early arrival prior to flight. If you still need a 405 closure detour map, we have one available for you.